It is the winter holiday period in Lake Placid and town is hopping. 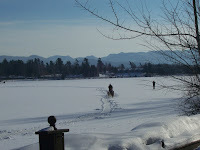 There are a vast variety of things to keep a family occupied; from taking a dog sled ride on Mirror Lake, to skating and skiing of every kind. You could exhaust yourself and still not do and see everything. I have lived here for twenty years and still haven't finished playing! Since this is a blog focusing on Adirondack real estate, I would be remiss if I neglected to mention the impact a burgeoning tourism industry has on investment property. Huge. The number of people visiting the Adirondacks continues to climb. According to Lake Placid's tourism king, once again, visits to Lake Placid are up 8% through November, 2007. His Highness mentioned, "For some reason we continue to see national media attention focusing on the Adirondacks. For example, the recent article in National Geographic Travel was great exposure as is this month's article in Backpacker magazine." His Highness is far too humble when he says, "For some reason.." since everyone knows the Lake Placid Convention and Visitor's Bureau does a great job getting the word out about the Adirondacks and Lake Placid. If you would like to hear about investment property opportunities, please give me a call at the Prudential Terry Horrocks Real Estate Agency in Lake Placid where I am an agent. By the way, skiing's great in New York State - especially in the Adirondacks!